Expo is in T-minus three days. We're ready(ish.) Are you? We, the staff here at The Escapist, have been working hard for these past several months to put together Expo 2013. 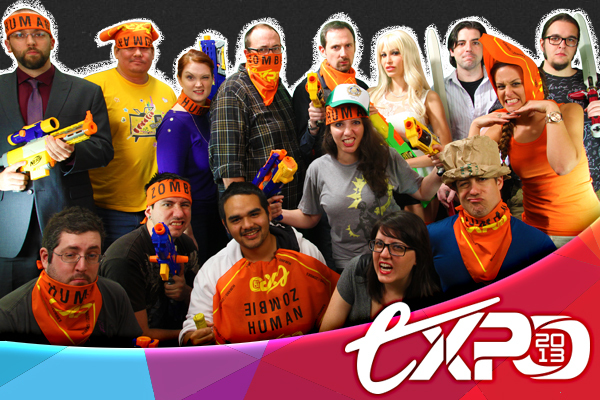 We've got our HvZ bandanas, our nerf guns and swords, and, of course, our panel schedule! Check us out at Expo 2013 this weekend, October 4, 5, and 6, right here in Durham, North Carolina. Can't make it? Keep an eye out for our Expo live stream, where you can check out the headlining panels all weekend long! For those attending, though, it's probably a good time to start planning your weekend. If you want to catch The Escapist staff's panels, you'll find a few of our panels and locations below. These are just a few of the panels that you can find Escapist staff on, so check your program for full details. In addition to these and other fun panels, we're also taking on Smosh Games in the ultimate Magic: the Gathering Showdown on Friday at 4:30pm in DCC Meeting Rooms 3-4. Come show your support for Janelle Bonanno, Justin Clouse, and myself, as we take Smosh Games to task in our favorite CCG. Justin Clouse will be busy this weekend, as he, alongside Schuyler Dievendorf and Jonathan Bolding, will be playing Smite from 11am to 1pm on Saturday at the Hi-Rez booth, so be sure to check them out! At a yet-to-be-determined time over the weekend, we'll even be gathering up for a friendly game of Johann Sebastian Joust in the Grand Ballroom, so keep an eye out for that, and watch The Escapist staff ducks, weaves, and whacks their way to victory! We here at The Escapist are thrilled to welcome everybody to Durham for Expo 2013. We'll look forward to seeing you all at the show!